Reproduction is an integral feature of all living beings. The process by which a living being produces its own like is called reproduction. Reproduction is important for each species, because this is the only way for a living being to continue its lineage. Apart from being important for a particular individual, reproduction is also important for the whole ecosystem. Reproduction helps in maintaining a proper balance among various biotic constituents of the ecosystem. Moreover, reproduction also facilitates evolution because variations come through reproduction; over several generations. There are two main types, viz. asexual and sexual reproduction. Asexual Reproduction: When a single parent is involved and no gamete formation takes place; the method is called asexual reproduction. No meiosis happens during asexual reproduction. Sexual Reproduction: When two parents are involved and gamete formation takes; the method is called sexual reproduction. Meiosis happens during gamete formation; which is an important step of sexual reproduction. Binary Fission: Most of the unicellular animals prefer this method for reproduction. These organisms reproduce by binary fission; especially when conditions are favourable, i.e. adequate amount of food and moisture is available. Binary fission is somewhat similar to mitosis. The mother cell divides into two daughter cells; and each daughter cell begins its life like a new individual. The parent generation ceases to exist, after binary fission. Amoeba is a very good example of the organism which reproduces by binary fission. Multiple Fission: When conditions become unfavourable, i.e. food, moisture, proper temperature, etc. are not available; this is the preferred mode of reproduction by unicellular organisms. The organism develops a thick coating around itself. This is called cyst. The cyst helps the organism to tide over the bad phase. The nucleus divides into several nuclei and each daughter nucleus is surrounded by a membrane. All metabolic activities stop in the organism, after cyst formation. When favourable conditions return, the cyst dissolves or breaks down; releasing the daughter nuclei. 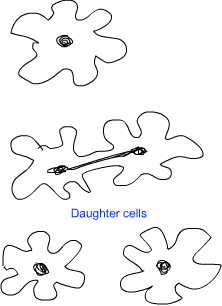 The daughter nuclei; in turn; grow into new individuals. Plasmodium and entamoeba undergo cyst stage, when they are not in the body of their prime host, i.e. humans. Budding: Yeast is an example of unicellular organism which reproduces by budding. Hydra is an example of multicellular organism which reproduces by this method. Budding in Yeast: A small bud grows at any end of the yeast cell. Nucleus gets elongated and a part of it protrudes into the bud. The nucleus then divides into two nuclei. One of the nuclei goes into the bud. The bud grows to certain extent and gets detached from the mother cell. Budding in Hydra: A bud grows anywhere on the main body of hydra. The bud grows to a certain size and gets detached from the mother hydra. This develops further to grow into a new individual. 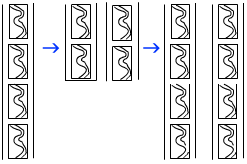 Fragmentation: Reproduction by fragmentation is seen in filamentous algae, e.g. spirogyra. The filament of spirogyra divides into many pieces and each piece develops into a new individual. Regeneration: Some simple organisms can regenerate a new individual from a part which has been accidentally cut off. Planaria shows good example of reproduction by regeneration. If a planaria is cut into several pieces; each piece develops into a new individual. Spore Formation: Most of the fungi, bryophytes and pteridophytes reproduce by this method. Spores are produced in special spore-bearing organs; called sporangium. When spores mature; the sporangium bursts open to release them. Advantages of Spore Formation: In fact, spores give certain survival benefits to the organisms which reproduce by spores. Spores can be disseminated through air and water or even through some other carriers; like animals. This helps an organism to spread its presence to a wider geographical area. Spores can also remain dormant for a long time, till favourable conditions are found. Scientists consider spores are precursors of seeds. Vegetative Propagation: Vegetative propagation is a special case, as it happens in higher plants; which otherwise have the capability to reproduce sexually. When a vegetative part of a flowering plant reproduces a new plant, it is called vegetative propagation. Some examples of vegetative propagation are given below. Tuber of Potato: The potato tuber is a modified stem. Many notches can be seen on the surface of potato. These are called ‘eyes’ of potato. Each ‘eye’ of a potato can give rise to a new potato plant. Farmers utilize this capability of potatoes to grow potato more quickly; which is not possible by using the seeds of potato. Modified roots of Carrot and Sweet Potato: Carrot and sweet potato are examples of modifications of roots; for food storage. These roots can give rise to new plants; when kept under the soil. Rhizomes of Ginger and Turmeric: Rhizomes are examples of modified underground stems for food storage. These contain nodes, internodes and scaly leaves. When buried under the soil, the rhizomes produce new plants. Leaf of Bryophyllum: Leaves of bryophyllum have notches on the margin. If a leaf is put under the soil, small saplings grow from the notches on the leaf margin. Artificial Vegetative Propagation: Man has used artificial vegetative propagation to grow many plants. This has enabled farmers and horticulturists to grow many plants in shorter duration and has helped them to earn more profit. Artificial vegetative propagation has also helped in developing many new varieties of plants. Stem cutting, layering and grafting are the preferred means of artificial vegetative propagation. The organism does not have to depend on another organism for carrying out reproduction; because a single parent is needed. It takes less time than sexual reproduction and hence more number of offspring can be produced in shorter time. The offspring are exact clones of their parent. Desirable characteristics can be easily incorporated into plants with artificial vegetative propagation. As a single parent is involved, so there is negligible chance of variation. In most of the cases in simple organisms, the parent generation ceases to exist after asexual reproduction. Asexual reproduction cannot give rise to biodiversity which is important for a healthy ecosystem. Amoeba usually reproduces which type of asexual reproduction? Name a fungus which reproduces by spore formation. Name an animal which reproduces by regeneration.